Believe it or not, I still have a pulse — and taste buds. And those taste buds have been dancing with delight over a new discovery. Have you heard about Coconut Bliss? If you haven’t, allow me to share the good news. It’s a dairy-free ice cream made from coconut milk that you can buy in your health food store, and it’s oh-so-heavenly. See, I’m on a dairy-free kick for a bit to check for sensitivities, and I really wanted an ice cream fix the other day. I needed ice cream. While I’m all about making coconut ice cream at home (hats off to Kimifor that brilliant idea), my new itty-bitty freezer doesn’t provide sufficient room for my Kitchen Aid ice cream maker bowl. Oh woe. Until I procure an additional freezer, then, I have to buy my frozen treats in the store. Fortunately, I remembered seeing an ad for coconut ice cream and decided to check out Whole Foods’ offerings. Sure enough, both Nada Moo and Coconut Blissgraced the shelves. We nabbed Maple Pecan Nada Moo (giggle with me over their tag line: “When Having a Cow Is Out of the Question”) and Vanilla Island Coconut Bliss. We needed one of each. For research purposes, you see. The Nada Moo was yummy, yes, and far better than rice milk ice cream, but it didn’t come close to touching the profound excellence of Coconut Bliss. CB was rich, velvety, full-flavored, sweetened perfectly, and just plain fabulous. My mother-in-law said she might like it even better than regular ice cream. We all agreed that we’d consider it on even footing with gourmet ice cream. Because I wanted to be absolutely sure about this recommendation before posting it, ahem, I bought another pint over the weekend, this time of Chocolate Hazelnut Fudge. Studded with gorgeous chunks of hazelnuts and a thin fudgy ribbon, it was heaven on a spoon. I’m so hooked. So if you’re dairy-free, vegan, or if you’re merely an ice cream fanatic looking for the next thrill, you musttry this stuff. It costs a pretty penny ($5 to $6 a pint), but it’s made with only organic and fair trade ingredients, and the dessert is so rich, a pint can satisfy four people. Even once I get my home ice cream maker up and running, I’ll indulge in CB’s version regularly. You simply can’t get that knock-your-socks-off texture at home. Check out CB’s website for more info on their ingredients, story, and where to buy their products. One last thought: The Vanilla Island flavor was awesome topped with fresh, local peaches. Mmmm! Wow! I can’t believe how great this recipe (slightly adapted from The Nourishing Gourmet) turned out! Even though I can eat raw cows’ milk products with no problems, I will make this again and again. I had to scramble to give it away before I ate the entire batch. Fortunately, we have a five-year-old girl living next door who was recently diagnosed with a milk allergy. I’m guessing she hasn’t had ice cream in a long time, so I took a generous serving over there for her gastronomic delight. Then I shared some with our boarder. All told, after my husband ate some too, I consumed a reasonable amount. Thank goodness for friends and neighbors! Verdict: we all adored this ice cream. It was wonderful soft-serve style straight out of the ice cream maker. After about an hour of curing in the freezer, it was still fantastic. Later than that, it got a bit too firm for my taste, but setting it out the counter cured that in a jiffy. Although I will certainly experiment with this recipe, I want to go ahead and post it because it’s fantastic as-is, and I don’t want my friends to live without it any longer than absolutely necessary (that means you, Marie). 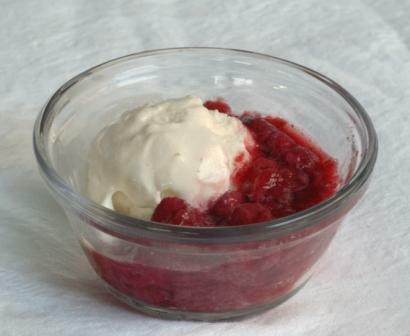 As you can see in the recipe below, I used half agave nectar and “half” stevia to sweeten the dessert. In the future, I may try using all stevia. 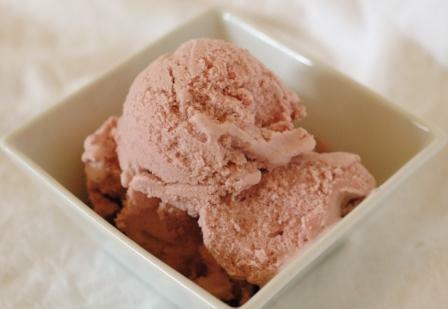 Using these sweeteners makes this ice cream ideal for diabetics and hypoglycemics. Agave nectar has a lower glycemic index than sugar (although there is some debate on agave’s overall healthfulness), and stevia has no impact on blood sugar at all (and zero calories), as it’s simply the extract of a sweet herb. Other planned modifications include using melted unsweetened chocolate instead of cocoa powder [Update 9/7/08: This didn’t work well texturally], adding a little vodka to the batter to keep it from freezing too hard, and adding chili and cinnamon for a Mayan twist [Update 9/7/08: The cinnamon was great! Shredded coconut works nicely too]. I’ll definitely update this recipe with the results of my experiments. An important note: do not attempt to use light coconut milk. It will not produce the same texture or flavor, and, on top of that, you’ll miss out on the great health benefits of the medium-chain fatty acids found in coconut. Also be careful not to accidentally pick up coconut cream, an entirely different and heavily sweetened product. If even goats’ milk is a problem for you or a family member, use all coconut milk, which is how the recipe was originally written. You can find agave nectar and stevia in your local health food store or Whole Foods-type market and some HEB locations. The stevia hangs out in the supplements section. Pour the coconut milk into a large measuring cup and add enough goats’ milk to equal a total of 3 cups of liquid. Pour about 1 cup into a small bowl and gradually add the cocoa powder, whisking vigorously to remove all lumps. Add the cocoa mixture to the rest of the milk and stir in the rest of the ingredients. Prepare the dessert according to your ice cream maker’s instructions. For dairy-free recipe ideas, visit Kimi’s blog, The Nourishing Gourmet. I think you’ll like it!